Now that Donald Trump’s handpicked Attorney General William Barr has wildly mischaracterized the Mueller report, and large chunks of the mainstream media are parroting Barr’s words instead of pointing out why Barr’s words are dubious, it’s given Trump and his allies a brief window of opportunity to try to control the narrative by accusing others of having ‘framed’ him. This window will close once the actual Mueller report surfaces, so Trump has to move quickly. Now he has a problem. For weeks, Donald Trump has been accusing the late Republican Senator John McCain of having been in on the plot to frame him, after McCain obtained a copy of the Steele dossier just after the 2016 election and turned it over to the FBI for investigation. Trump’s semi-coherent rants about McCain have suggested that the FBI, McCain, the Democrats, and a number of other entities who have never gotten along with each other, were somehow conspiring to put this dossier in play for political reasons. This narrative is absurd. But if there’s ever a time when Trump might be able to get it to stick, it’s right now, post-Barr summary and pre-Mueller report. The trouble is that one of Trump’s closest political and personal allies just stepped in it. 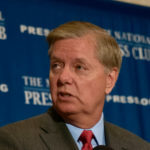 According to CNN, Lindsey Graham just admitted that when John McCain first got his hands on the Steele dossier, he consulted with Graham about what to do, and Graham advised him to give it to the FBI. Oops. The trouble for Donald Trump is that his attacks on John McCain have put Lindsey Graham in a difficult spot. Whatever it is that Trump has used to turn Graham into such a loyal lapdog, Graham still has his decades-long allegiance to McCain. Now Graham, while trying to defend McCain’s honor, just screwed up and undermined Trump’s “witch hunt” narrative. You can bet that Graham’s words will be thrown back in Trump’s face whenever he tries to claim that McCain conspired with everyone to “frame” him in the Russia scandal.